Ok, it’s over. The super moon everyone’s been talking about for the last month has come and gone. However, I still hear questions about what exactly made this super moon special. So I figured it would be a good idea to write this blog entry explaining it. This will be old news to those in the know, but I’ll start with a very simple explanation of the celestial mechanics at work here for those that don’t understand. The moon revolves around the Earth once every 27.3 days. But it’s orbit isn’t perfectly circular. Because of the gravitational tug of the sun, it travels in a slightly elliptical orbit at an average distance of approximately 381 000 km. At its closest point (perigee), that distance is reduced to a ‘mere’ 357 000 km. At its farthest point (apogee), the moon is at 406 000 km. At it’s closest point, it’s about 50 000 km closer to the Earth than at apogee. So technically, there’s a “super moon” every month when the moon is at perigee, but it’s only considered to be a true super moon when perigee coincides with the full moon, resulting in a larger apparent size and significant increase in brightness. And that’s what just happened this month.Most people I’ve spoken to about this didn’t really notice a difference in size. To someone who doesn’t look at the moon a whole lot, this is quite understandable. The angular size of the moon only appeared 14% larger than normal, which isn’t really a noticeable difference. However, there was a 30% increase in brightness, and I think most people could easily notice that. I know I certainly did! I was out with my scope on the night before the full moon (97% full) and sky was very bright. And the shadows cast by the moon were far more pronounced than usual. There was no mistaking the added brightness!In the days leading up to the full moon, I was out a few times taking some images. The full moon is the worst time of month to take images of the moon. The lack of any shadows makes the surface look very bland and 2 dimensional, not to mention the high brightness wreaks havoc on cameras CCDs. But nonetheless, I was determined to get some images. 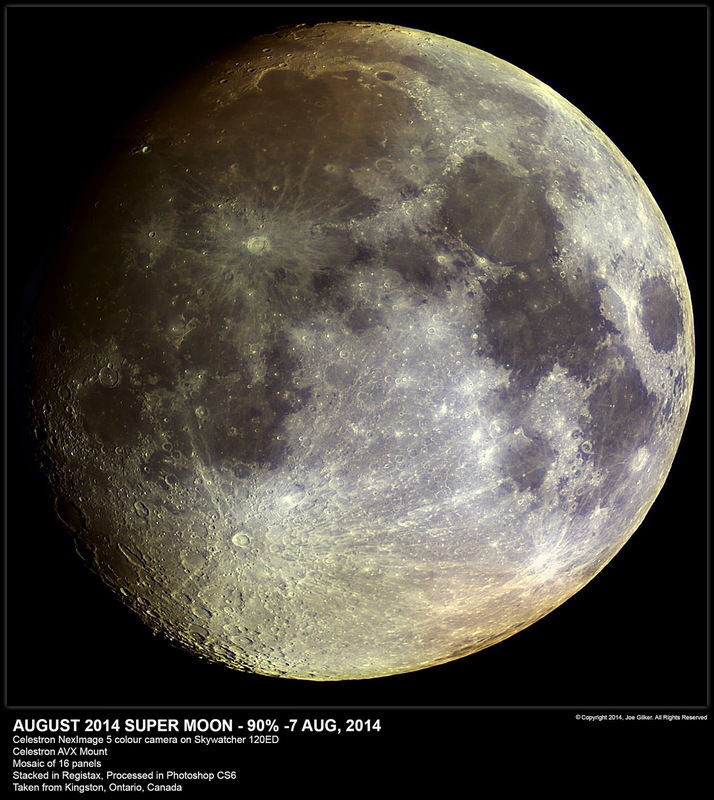 The first project I attempted was a mosaic of the moon on August 7. 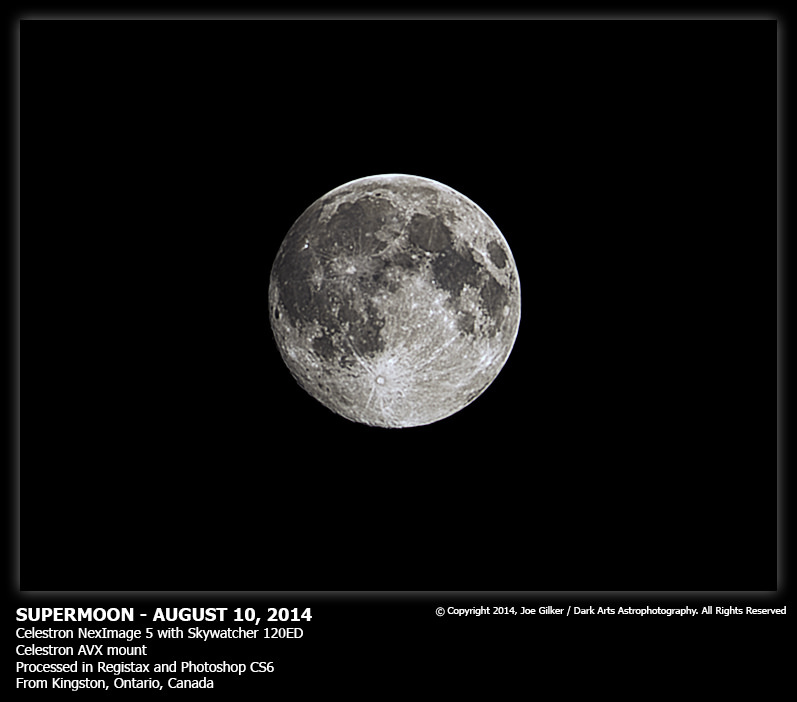 The moon was at 90% full and quite close to perigee. Using my Skywatcher 120ED refractor and my Celestron NexImage 5, I started systematically taking shots of the entire surface. 16 frames later, I had the entire surface covered. I later processed the images and stitched them together using Auto Pano Giga to produce this full mosaic of our celestial neighbor. For a full resolution view, I would strongly advise checking the link below the image so you can see the full size image on my Flickr page. And of course, I couldn’t let the supermoon get by without getting a single, full frame shot as well on the day of the full moon. This one was done using my Skywatcher 120ED and my Nikon D7000 DSLR. It’s not a big image since my little f/5 refractor is really intended for wide angle photography, but the results were still quite pleasing overall. So now that the pesky moon is starting to leave our evening sky once again, I’ll be following up with some more deep sky imaging in the coming weeks. My 8″ Meade LX90 has been out for repair all summer due to a motor failure. It’s been shipped back to me and I should be receiving it in the next couple of days. Happy times will be here again!Until next time, clear skies.